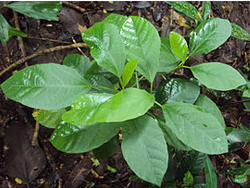 You are at:Home»Herbs»Baliospermum montanum (Willd.) Muell. Latin name : Baliospermum montanum (Willd.) Muell. Description : The root is acrid, anodyne, anthelmintic, antiinflammatory, carminative, diaphoretic, digestive, diuretic, febrifuge, pungent, purgative, thermogenic and tonic. It is useful in oedema, flatulence, constipation, jaundice, haemorrhoids, skin diseases, strangury, wounds, splenomegaly, anaemia, leucoderma, fever and vitiated conditions of vata.